At the Plaza every daily gesture becomes art of living. and the all-Italian quality that surrounds you in every environment. Relax and discover a new smile. You decide how much time you need. Finally Spring! It's Spring Break time. 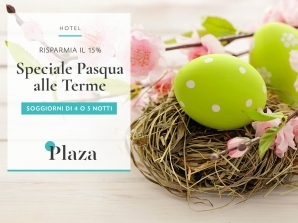 Save 15% with our Special Offers for Easter and Spring Vacations. From April 17th to June 3rd 2019. Check out now! Let yourself be embraced by the wellness offered by our two swimming pools: one featuring thermal spa water and the other fresh water. Revitalize your body and soul in a quiet, welcoming atmosphere under the flag of Plaza Hotel. Rediscover your inner balance, thanks to an unforgettable vacation. Enjoy the Plaza lifestyle on a journey to discover the flavours of the Padua area. Immerse yourself in the flavour of wholesomeness that is good for the body and soul. Make your Abano Terme stay unique by experiencing the territory through sports, art, food, wine and nature. Treat your loved ones with the gift of wellness for yourself and for the people you love. 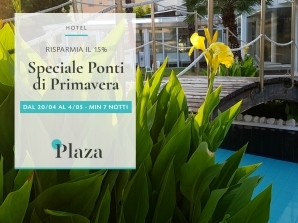 A birthday, an anniversary, the celebration of special event or the simple desire to be together are the backdrop of a wellness program designed for you by Plaza Hotel and Plaza Sensory Pool. 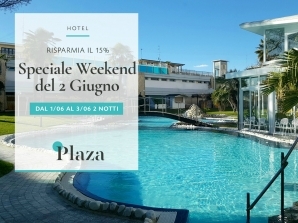 Live your experience to the full with Plaza's special offers.